is 20% of the full amount, later cancellations are charged with 100% of the full amount. Located just metres from the main station we would like to offer you an affordable and comfortable choice of accommodation. You can stay in one of our beautifully and individually furnished Doubles or Dorms and enjoy the cosy atmosphere together with other Travellers and Backpackers from all over the world. We love backpacking and we love nature and therefore do our very best to give you a homey & natural place where you can relax from the wild days on the road. The team of the Hostel is there for you, we would like to help you with planning your Heidelberg stay and onward journey. Everything we know and love about this town we are happy to share with you, so please feel free to ask us anything you would like to know. De gratis fietsen zijn een heel fijne toevoeging aan dit hostel! I had a lovely stay at the hostel. I was in Heidelberg to visit a conference from EMBO-EMBL, it was the perfect location for me since the shuttle bus stopped 5 min away from the hostel and it is close to the central station. Really friendly staff! Heel erg fijn hostel. Ik bezocht en conferentie van EMBO-EMBL en de shutlle bus stopte op enkele minuten van het hostel vandaan, ideale locatie dus (ook vlak naast het centraal station). Hele vriendelijke mensen! 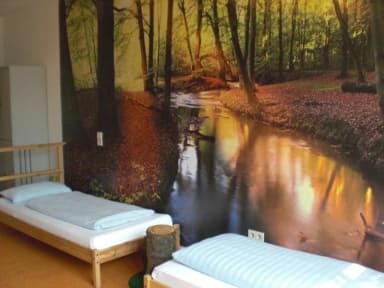 Netjes hostel met vriendelijk personeel. Een goed ontbijt tegen een kleine vergoeding. Het hostel staat op 15 minuten lopen van het centrum. De kamers zijn ruim opgezet. Super grote nette kamer, wel warm in de zomer maar er was een ventilator. Nette douche en wc's met ruimte om je was op te hangen! Aardig personeel. Leuke gelegen, op een terrein met verschillende eetgelegenheden. Met 2 minuten sta je op het treinstation! Ik zou hier weer boeken. Hostel was fine, location is very convenient if you're traveling by train, but a bit far from the city center. Nice hostel with a relaxed atmosphere. It was very warm on the rooms (no AC), and the corridors smelled bad. The hostel location was further away from the city center than expected, but it was okay when using public transport. The hostel is on the 3rd floor and on the ground floor is a Casino causing a lot of noise during the night. The hostel itself is very nice.